Russell Stendal has a heart to follow God. At the age of 4, Stendal prayed that his parents would become missionaries. 4 years later, his family was on the mission field. On November 9th, Stendal was a guest missionary speaker at Alaska Bible College’s Thursday Chapel called Student Gathering. 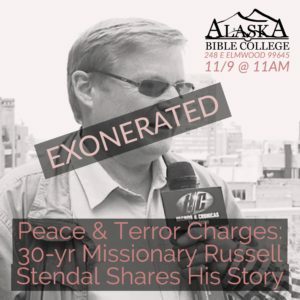 If you have ever heard someone who dismisses the most incredible, dramatic parts of their life (think: kidnapped and tied to a tree by guerilla soldiers in Colombia) to share only how God has allowed him to proclaim the gospel to those within his reach, you would find a story like Russell Stendal’s. A man whose ministry passion is richly blended with Biblical insight. At the school, we led the promotion of Stendal’s visit with the “Exonerated” promo image after reading the Christianity Today article. We wanted people to know that he was coming to visit and share at the school. All Stendal wanted to do was share how Jesus is reaching and transforming the lives of many in Colombia. You see, Stendal was charged with terrorism in Colombia for working with FARC, a rebel group. But he didn’t lead with that story when he shared with us. (Spoiler alert: Stendal was exonerated of his terrorism charges.) What he shared was how his organization had given away 1 million Bibles in Colombia — some of those dropped from an airplane with a radio attached with worship music and the gospel. He shared that he sits at the table as the chaplain to both the rebels and the government generals to help facilitate their peaceful reconciliation process. He shared that as someone charged as a guerilla, he has gained credibility with revolutionary sympathizers in Cuba and is able to share the Good News of the Prince of Peace there, too. He shared with us how the Bible translations in South America were very heavy on predestination, but believers had little-to-no concept of free will — so Stendal started and completed a translation, called the Jubilee Bible. He shared with our students that some of the former guerilla fighters he shared the gospel with are now taking the Jubilee Bible over the border into Venezuela to share Jesus there too. Let’s repeat that: former guerilla fighters who have repented and followed Jesus the Messiah are currently in the business of distributing Bibles. Fantastic! What an incredible example to our students of how God will continue to use our next steps in faith to further His kingdom! We were blessed to have Russell Stendal come and share with us about his story, which is so greatly intertwined with what God is doing in South America. You can’t listen to a story like that and not want to jump into your own ministry influence with the same faith-filled ambition. At lunch after chapel, Stendal mentioned that the best way to keep up with his organization, Colombia Para Cristo (Colombia For Christ), is to go to to their website and sign up for their “Prayer Alert” email list. If you would like to read more about Stendal’s ministry, there are a few of his books in the Alaska Bible College library. If you would like to purchase Stendal’s books online, go to Amazon Smile!